Where the field was warm and green. With a joy I'd never seen. From the hot dogs and the beer. Yes, there used to be a ballpark, right here. It is likely that Frank Sinatra was thinking of Brooklyn's long gone Ebbets Field when he sang those words back in 1973, but there have been lots of ballparks that have disappeared over the years. In this and future blog postings, I'll take a look (and I do mean "look" ... we'll examine a number of images) at a few parks that are gone, but not forgotten. First up: The old Athletics ballpark at 17th and Columbia in Philadelphia. Titled "The Second Great Match Game for the Championship," the print depicts action from an October 22nd, 1866, match between the Athletics (at bat) and the visiting Atlantic Base Ball Club of Brooklyn (in the field). (The Athletics won 31-12.) The illustration was created and printed by John L. Magee of Philadelphia. 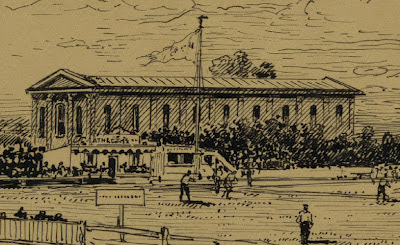 And note that at the center of the drawing, as seen in the detail below, there is a small structure with "ATHLETIC 1860" posted across the façade. Why 1860? Because the Philadelphia club was organized on April 7th of that year. This is assuredly the on-field clubhouse of the Athletic Club. 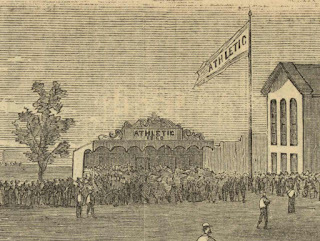 I recently came across an image of the Athletics home grounds at 17th and Columbia that was completely new to me. This one, found at the Historical Society of Pennsylvania, dates from August of 1868 and was drawn by Francis H. Schell. Take another look at the Magee color lithograph of the ballpark. Given the angle of the scene, it wouldn't surprise me if the illustrator was in the Wagner Free Institute building when he sketched the action. My good friend Rob Pendell has solved the mystery of the meaning of "My Toodles." First, it should be noted that I have access to an original Magee lithograph and, upon closer examination, the writing at the top of the paper more likely reads "Mr. Toodles," not "My Toodles." Rob did not have this advantage and thought perhaps the writing was "The Toodles." Here's what Rob calls "a wild theory," but what I feel is most certainly the explanation. I have a wild theory about your "Toodles" inquiry. First, a question: are you sure the paper says "My Toodles" and not "The Toodles?" From the pictures posted it's not clear. I think it says "The Toodles." 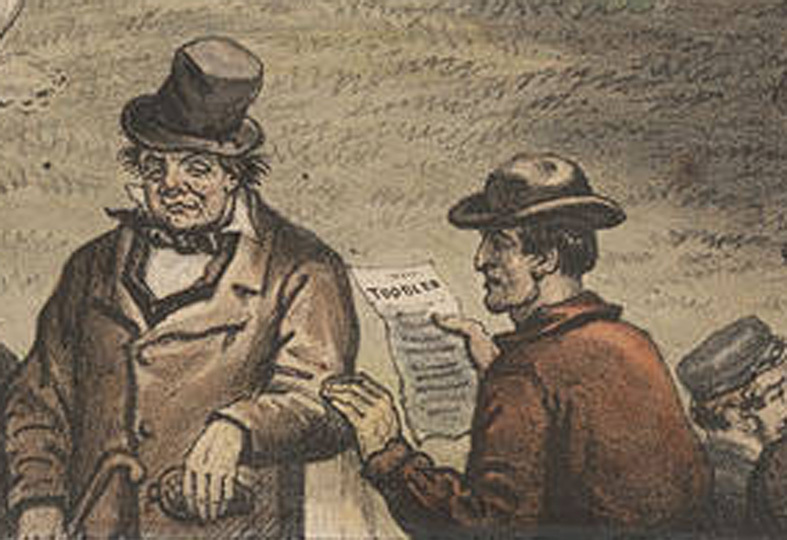 I think the man holding the paper is supposed to be Edwin Booth. I think the man to whom he is gesturing is John Sleeper Clarke. "The Toodles" was a very popular play of the time, and the lead, a boozer, was one of Clarke's most famous roles. 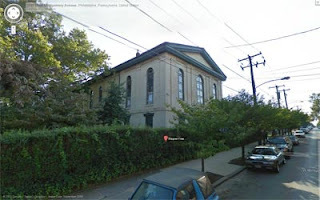 Booth and Clarke purchased the Walnut Street Theater in Philadelphia in 1863 or 1865 (depending on the source), or maybe Booth bought it and brought Clarke on afterwards, but either way they were running it together when Booth's brother shot the president. Clarke, who had married Booth's sister in 1859, was found to be in possession of letters written by John Wilkes Booth and subsequently arrested for some time. He eventually left his wife and ran off to London where he did 200-some performances of "The Toodles." Random fact #1: Lincoln saw "The Toodles" performed by its credited author and first famous lead William E. Burton in Chicago in 1859. Random fact #2: Months before the president was assassinated, Edwin Booth saved the life of Lincoln's son, Robert, during an incident on a train platform. The young Lincoln immediately recognized the face of his rescuer, presumably from his acting reputation, but Booth didn't discover who it was he saved until months later. Magee did many political cartoons and lithographs, including a famous one of John Wilkes Booth titled "Satan Tempting Booth To The Murder Of The President." I have more weird facts about all this, but I'll leave it there. That's my theory and I'm sticking to it. I recently bumped into a couple of additional images of Athletics Park, this time featured on two different pieces of sheet music. One can be found on the cover of "The Base Ball Fever," published in 1867 by the Philadelphia firm of Marsh and Bubna, whose offices were located at 1029 Chestnut, just two miles south of the park. The music was dedicated to Lew Simmons, a veteran of the theater, a talented banjo player, and a member of the Athletics Base Ball Club. The full sheet music can be found at the Lester S. Levy Sheet Music Collection at Johns Hopkins University's web site. 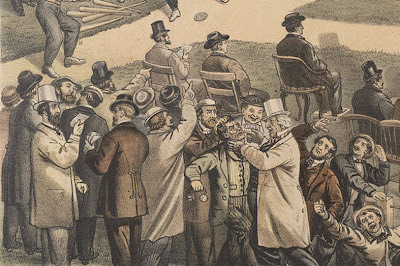 The baseball scene in the second piece of sheet music, titled "Home Run Polka," is obviously based on the image seen above (or perhaps vice versa?). 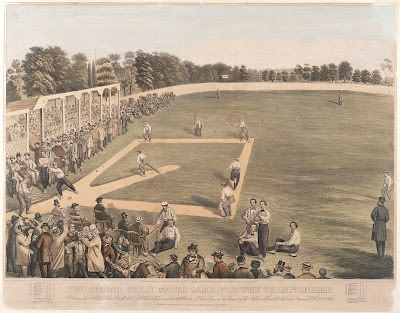 Also published in 1867 by Marsh and Bubna, this piece was dedicated to the National Base Ball Club of Washington, D.C. Just why an image of a Philadelphia ballpark (with the Wagner Free Institute of Science clearly depicted in the background) was used is a mystery. As with "The Base Ball Fever," the full sheet music for "Home Run Polka" can be found at the Lester S. Levy Sheet Music Collection. Interestingly, in the Robert Edwards auction of Spring 2011 the following piece was offered. Note that it features the artwork from "Home Run Polka," but the text from "The Base Ball Fever." Outstanding! I have a new spot to visit next time I am in Philadelphia, now. 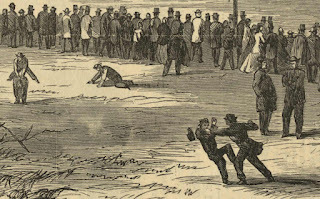 As a side note, the Athletics actually were organized in 1859, but playing the Philadelphia version of baseball (called "town ball," as was usual in Pennsylvania, the Ohio River valley, and the South). They switched to "base ball" (i.e. the New York game) the following year. Some time in the mid-1860s they collectively (or conveniently) forgot about their town ball past and reassigned their date of formation to when they made the switch. 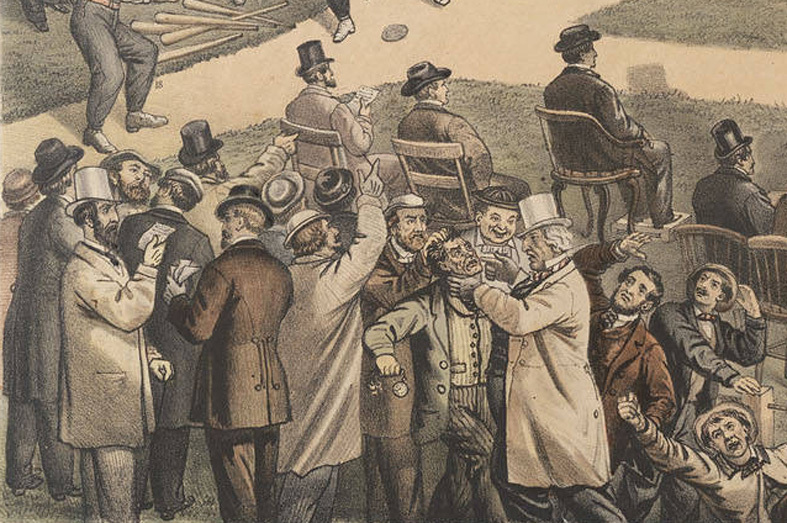 The Olympic club, by way of contrast, went the other way and emphasized their town ball history, as it gave them seniority even over the Knickerbockers. And this is why I keep coming for more... Excellent stuff Tom and thanks for sharing. check out www.phillyvintagebaseball.org - we are re-living the dream! Great post by the way! Outstanding stuff! Hello. I stumbled upon this blog while doing some research on the Wagner Free Institute of Science. (Well, my dissertation in the history of science, actually) Anyway, I was trawling through some old newspapers and found the following account in the August 12, 1865 edition of the New York times and thought you might be interested. 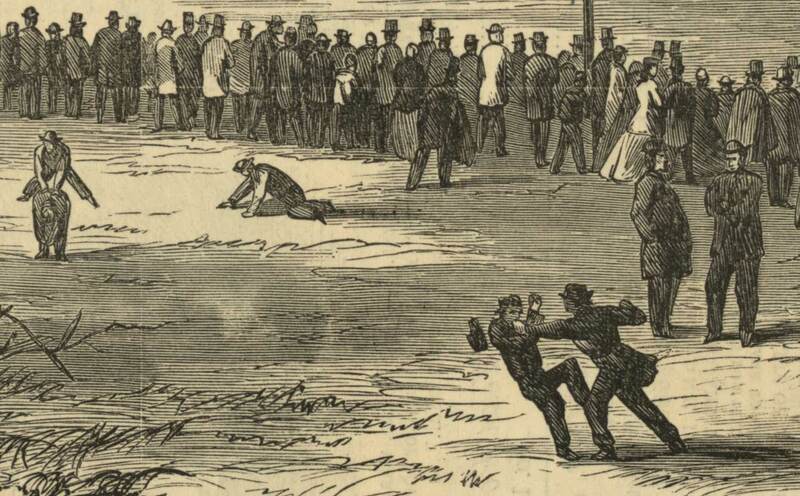 The headline reads "Interesting Base Ball Match. 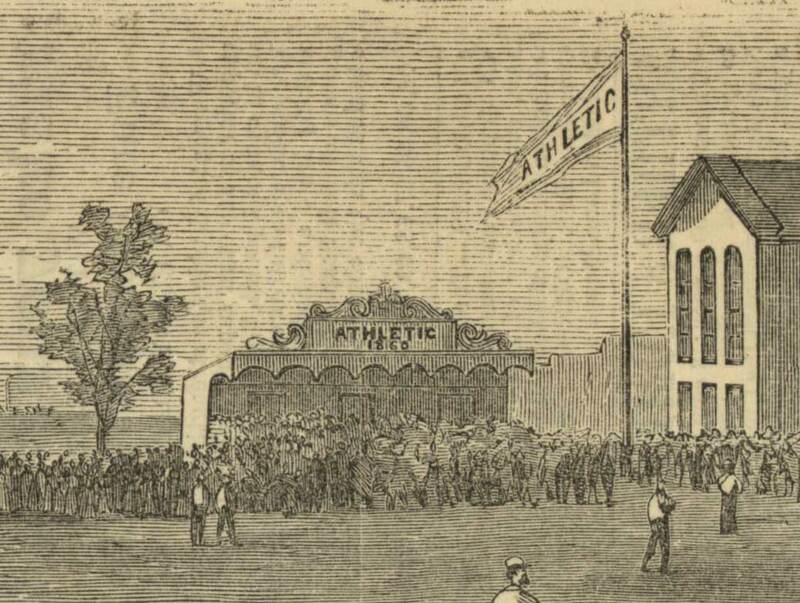 The Actives of New-York Against the Athletics of Philadelphia"
"Two prominent members of the Athletic [sic] were absent through indisposition, and a favorite ball used by the Club was lost at an early period of the game and while the scores were nearly equal. It is stated that this circumstance affected the playing of the Athletics. This ball was knocked over the fence that separates the Athletic [sic] play ground from the premises of the Wagner Free Institute of Science. The Principal of that Institution secured the ball and resolutely declined to give it up to the owners, a circumstance which created considerable indignation, and which it is stated has been done on a number of similar occasions." It doesn't sound like William Wagner got along with his athletic neighbors. It doesn't sound like he would be willing to let anyone in to draw the field, but I honestly don't know. Have a great day and thanks for the images. 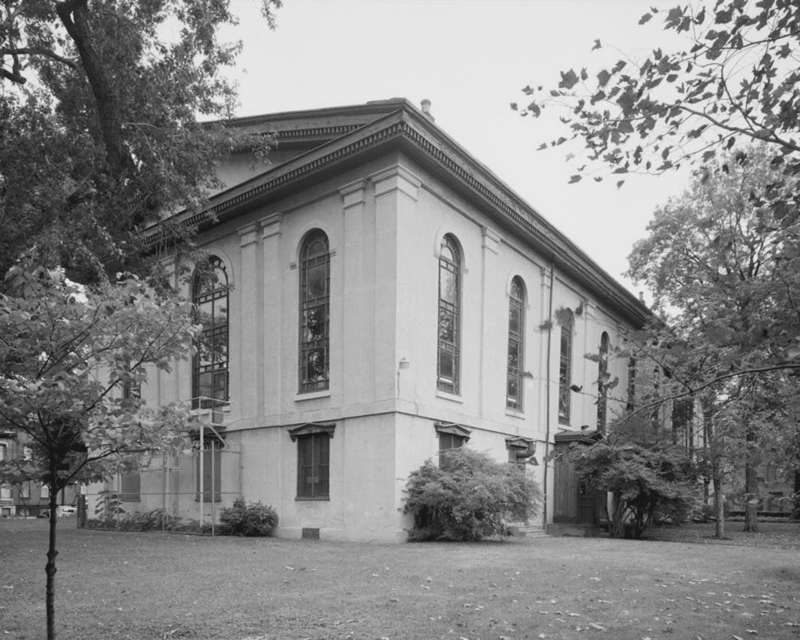 Also, while the cornerstone was laid in 1859, the building wasn't completed until after the war in 1865.